Heads up! This tutorial is for the TFMini that outputs serial data via UART. 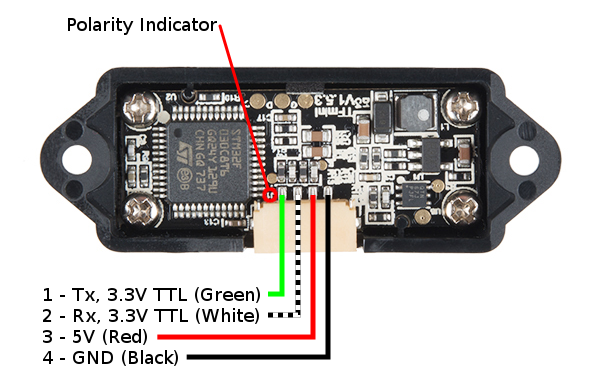 If you are using the Qwiic enabled TFMini that outputs serial data via I2C [ SEN-14786 ], please refer to the TFMini - Micro LiDAR Module (Qwiic) Hookup Guide. The TFMini is a ToF (Time of Flight) LiDAR sensor capable of measuring the distance to an object as close as 30 cm and as far as 12 meters! 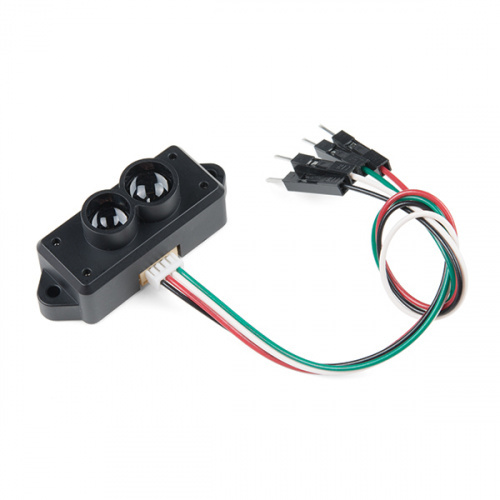 The TFMini allows you to integrate LiDAR into applications traditionally reserved for smaller sensors such as the SHARP GP-series infrared rangefinders. 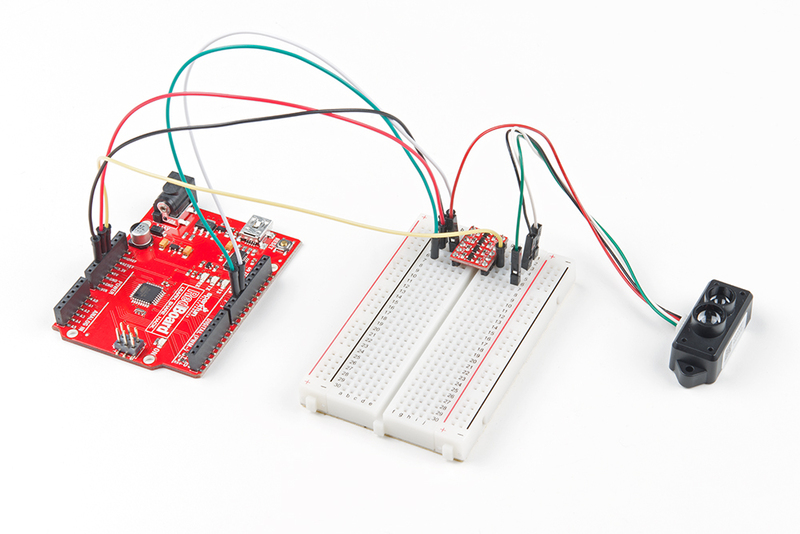 In this tutorial, you will learn how to connect to the TFMini using an Arduino microcontroller. Note: This product does not use laser light for ranging. Instead it contains an LED and optics. Many such systems are being marketed under the name "LiDAR," although it may be more appropriate to think of this device as a "Time-of-Flight Infrared Rangefinder". It differs significantly from traditional IR rangefinders in that it uses ToF to determine range and not triangulation — as is performed by the Sharp GP-series devices. The sensor works by sending a modulated near-infrared light out. The light that is reflected from the object returns to the sensor's receiver. The distance between the two can be converted using the sensor by calculating the time and phase difference. The distance measured may vary depending on the environment and the reflectivity of object. According to the datasheet (pg 4) the input voltage is between 4.5V-6V. In this tutorial, we will be applying 5V to the sensor. Current Draw Testing and Analysis: According to the datasheet, TFMini may pull up to ~800mA at peak current. Testing with a multimeter set to measure current and a 5V/2A power supply, the sensor was pulling about 66mA-68mA by itself. When using a 5V Arduino, logic level converter, and the sensor, the sensor was pulling about 98mA-92mA. For basic tests, 5V/500mA from a USB port should suffice. You may want to consider providing a sufficient power supply when using the sensor in a project. While the sensor can be powered at 5V, the serial UART pins are only 3.3V logic. Make sure to use a logic level converter when reading the sensor with a 5V microcontroller. There is a marking next to the polarized connector to indicate the polarity as "J1" as indicated in the image below. This is useful when referencing sensor's pinout. Advanced Users: For those that have experience with Arduino, you could go smaller and use a 5V/16MHz Arduino Pro Mini! Just make sure to also power the TFMini with 5V and use a logic level converter. For the purpose of this tutorial, we will be using a 5V Arduino. A microcontroller and logic level converter is required in order to read the sensor values through the serial UART pins. Make sure to solder the male header pins to the converter before making the connections on a breadboard. Begin by making a connection from an Arduino's high side and following the connection to the TFMini. Then continue to make the rest of the connections by following the hookup table listed below. Once we are finished, it should look like the image below. Download and install Peter Jansen's Arduino TFMini library using the library manager. You can also manually install it from the GitHub Repository by downloading the library from the button below. Grab a mini-USB cable and connect the Arduino to your computer. Upload the BasicReading.ino that was included in the library's examples to your Arduino. Make sure to use the correct COM port and board selection. Once uploaded, try moving an object in front of the sensor to test. 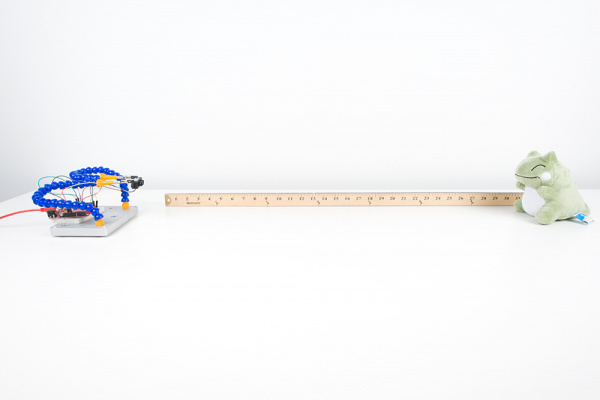 In the example below, a third hand was used to hold the TFMini when detecting an object at a certain distance away from the sensor. Since the sensor is not able to detect an object when less than 11.8 inches (or 30cm = 0.3m) away, the object under test was placed at 20 inches and 30 inches. Opening the serial monitor at 115200, you may see an output similar to the values printed below. Using a yard stick, the values responded as expected when moving an object between 20 inches and 30 inches. Troubleshooting: If you are receiving an error similar to the output below, it could be due to a few reasons. This may be caused by your Arduino not properly communicating with the TFMini. For example, the maximum baud an Arduino at 8MHz can handle with the software serial library is 57600 baud. If you are using a 3.3V/8MHz Arduino Pro Mini with a baud rate of 115200, it is probably too high which can cause unreliable readings. It is recommended to use a 5V/16MHz Arduino if you are using the software serial library to communicate with the sensor at 115200. As an alternative to check if the TFMini is still functioning at small distances, you can try using the TFMini&apos;s GUI with a USB-to-Serial cable. Just make sure that you are providing 5V for Vcc and communicating with 3.3V logic levels. Instructables: Benewake Lidar TFMini (Complete Guide) - For additional examples with a USB-to-Serial converter and Python, check out this guide! It's possible to use the TFMini with a Raspberry Pi! DIY Drones Forum: How to Install Benewake TFSeries on PixHawk - Check out this forum post to connect the TFMini to a PixHawk in order to detect the absolute altitude of your drone.